I thought Josh would be finished with projects after he remodeled our kitchen, but he loves having a project. This summer he has been doing a lot of yard work. He planted a huge vegetable garden with our neighbors, built a chicken coop, and last week he made a raised herb garden. I told Josh I wanted an herb garden, but I was thinking a few pots of herbs. Well, Josh never does things on a small scale. He built a masterpiece raised herb garden. It is amazing! We teamed up with Lowe’s on this DIY project and are thrilled with the results. To build the raised herb garden, Josh bought pressure treated 2×4’s, 2×6’s, and 4×4’s. He built the frame out of the pressure treated wood. 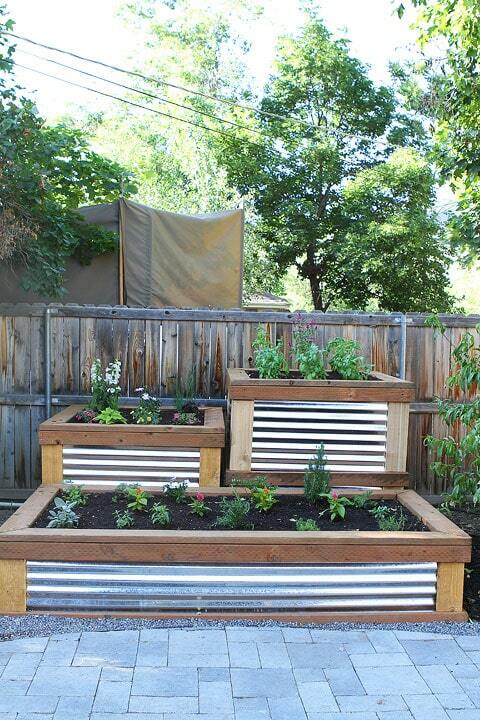 He used corrugated steel roof paneling to side the raised beds. To trim the sides, Josh used cedar fencing. Josh bought all of these materials at Lowe’s. We filled the raised garden beds with herbs and flowers. We planted lemon verbena, thyme, rosemary, sage, chives, lavender, cilantro, parsley, basil, thai basil, and flowers. We filled one bed with just basil. I see a lot of pesto in our future! Basil is my favorite herb. 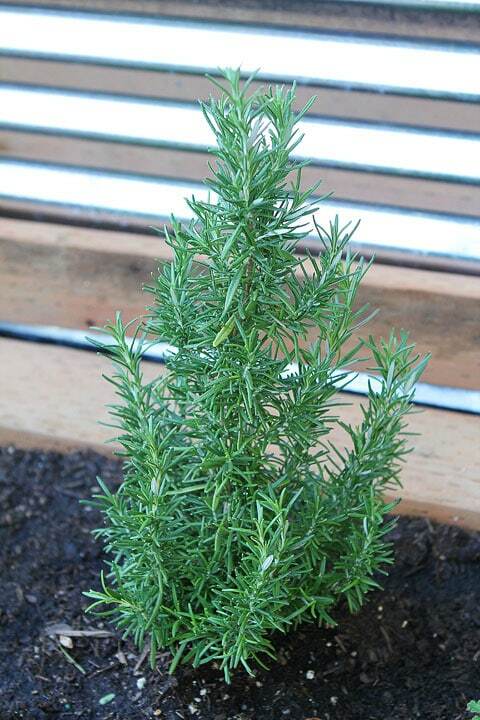 We planted two large rosemary plants. 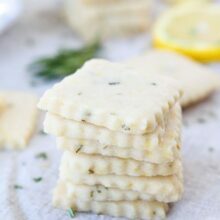 Plenty to make Rosemary Sea Salt Pretzels and Garlic Rosemary Parmesan Popcorn. Love these pink flowers. They are supposed to grow and spread down the front of the garden bed. I love that the lowest garden bed is also a bench. It is nice to have extra seating along the patio when we have guests. I am so glad Josh added the corrugated metal. It really jazzes up the garden beds. The raised herb garden really adds to our patio space. I love it! Hats off to Josh for creating such a beautiful raised herb and flower garden. I can’t wait to put the herbs to good use! Disclosure: Lowe’s provided most of the materials for us to create this beautiful raised herb garden, but our opinions are our own! Wow. What I wouldn’t give. Gorgeous!!!Maria! Congrats on this – seriously so beautiful and practical and something to be proud of! Wow! He is handy! That’s amazing that he finished in two days. Very nice. Wow, that is so beautiful! I love it and I want one!! Congratulations Maria & Josh, this is beutiful and very useful!! Gorgeous and so useful!!! Love it!!! My favorite herb is basil too! Lovely boxes! Please tell us how much dirt/soil and what kind of it you used. Also, in the taller sections, is there dirt all the way from the bottom? We are needing raised beds, I like this very much. The metal sides make sense to me. I just can’t figure out the right amount and best way to add the soil! Josh used Lowe’s potting soil. Josh put rocks and scrap wood we had to to fill the beds most of the way. 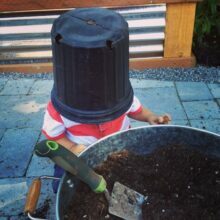 He put the soil on top. I hope that helps! I love the look of the metal fronts, what a great idea! I may have to steal your idea. I made our raised beds from the wood of our old deck when we removed it from the house. The beds aren’t pretty, but they were free to make. I like yours better. Steal away! I am so glad Josh did the aluminum. Very lovely garden! Do you have any trouble with critters trying to eat your veggies? We haven’t had any trouble yet! Fingers are crossed! Wow! Impressive! Send Josh to RI for a weekend please so I can put him to work! Enjoy your garden – it is beautiful! The beds are beautiful…love the seating idea. 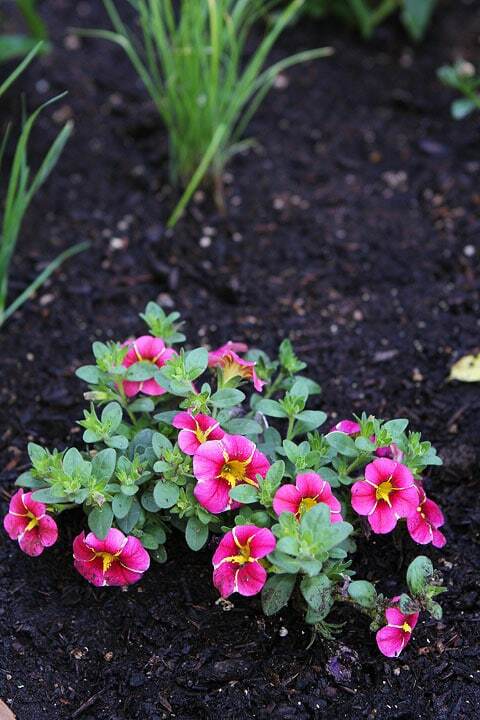 The flowers that will be trailing down your sides are calibrachoa. The green leafy plant is a ipomoea or sweet potato vine. Unfortunately no sweet potatoes ! For Eldonna, a good mix is 1/3 peat moss, 1/3 compost & 1/3 vermiculite….you can cheat a little on the requirements. Good luck with all your plants! This makes me wish I had a yard! Josh did an amazing job. Amazing! I wish I had this in my back yard! Josh has a lot of great talent. Wonderful garden to have and especially when you cook a lot. Beautiful! My husband now has a job for me this weekend! Thanks! Saw this on instagram! Your beds are just beautiful!! This is on our to do list for this weekend! A bit late in the season to be starting a raised bed… Thanks for the inspiration. Love it! So so beautiful Maria! Between you and Erin (Naturally Ella), I’m really craving outdoor space. How wonderful! We have a pallet herb garden that my husband made, and I’m loving being able to just pop out the door and grab some fresh basil, peppermint and cilantro. Josh did an excellent job! What a beautiful herb garden! Someday, when I move out of the city, I hope to have the space for something similar. I love fresh herbs. I tried growing a few on my kitchen windowsill (…that didn’t work out…). Love the containers and the flowers. Your yellow and pink row of flowers are saliva and the tall one the tall one with white flowers looks like it could be foxglove. I wish there was a close up to see for sure. Foxglove is a beautiful plant, but digitalis comes from it. Make sure your little guy doesn’t put any part of it in his mouth. 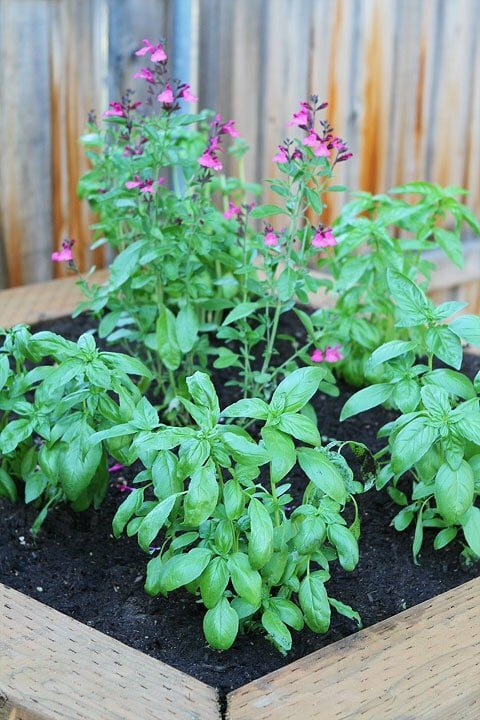 The pink flower in your basil looks like it could be penstamon. Did you know Utah grows more penstamon than any other place in the world? We are the Pestamon capitol. A red flag went up after reading some of the comments. Be very careful what you use for your wood for your pallet gardening or any of your containers. Older wood used toxic chemicals to preserve them. Most of the newer pallets use HT (heat treated) wood instead. The other problem is that you have no idea what was transported on those pallets. Any kind of chemical could have been spilled on the pallet and you would have no idea. The US requires all wood coming into the US to either be HT before entering or sprayed with MT (Methyl Bromide). Since the MT doesn’t take the time that HT does, you will find more of them. Older ones used an even more poisonous chemical. Make sure you don’t breath in any of the dust when cutting them. It turned out beautiful! I love the metal accents. 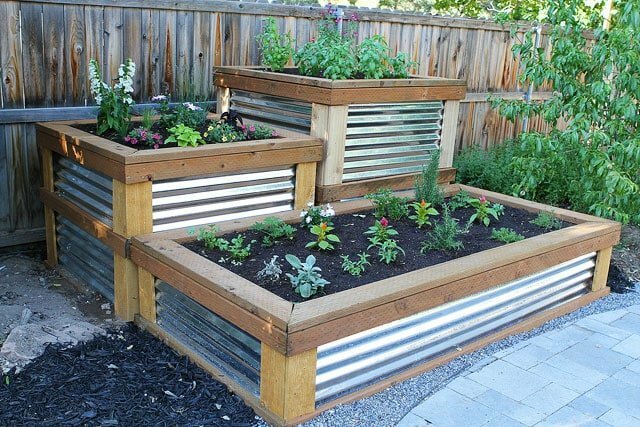 I am putting some raised beds in next year so I want the metal! You GUYS. This is so pimp! Nice job! Very nice. Did Lowe’s cut the metal for you to the size you wanted or did you have to do that yourself?? This is just the project Ben needs, too. Josh did a great job!! Lookin good!!! I am soooo jealous!!!!! Wow! Josh did a great job!! You’ll love having all that basil too! When the basil starts to get flowers on top, pinch them off so the plant will focus on growing the leaves rather than the flowers. Josh sounds like Ryan–always some project–Ryan’s have been all outside this year too! That looks amazing–this might need to be next summer’s project! Wow – looking good!! I want to steal this idea!! Love the different sizes and the modern feel with the aluminum, looks great! Great project! I have a space I have wanted to put planting boxes in, so I have a few questions. Are the aluminum panels over wood, or are they the actual sides? Did you line the inside of the boxes with anything (like weed block or plastic)? Does Lowes have step by step instructions or is this Josh’s own creation. Could you provide dimensions? Thanks for sharing! I’ve never seen such a pretty raised garden before! Love it!! This looks so good! I love the raised look and everything looks so neat and tidy! I love the metal sides too! One of my new favorite flowers is nasturium. It will start growing over the edge of a planter, and its leaves and flowers are edible and peppery. You should check it out for the next time you plant! I woulda never thought to do metal on the sides, I love it! We’re redoing our patios this summer, using that metal as the roofing. Obviously my garden beds need to match the patios, obviously. Thanks for the ideas and inspiration! Josh, you nailed this one! Um, is josh available to come to my house next week and build one for me? These are beautiful! 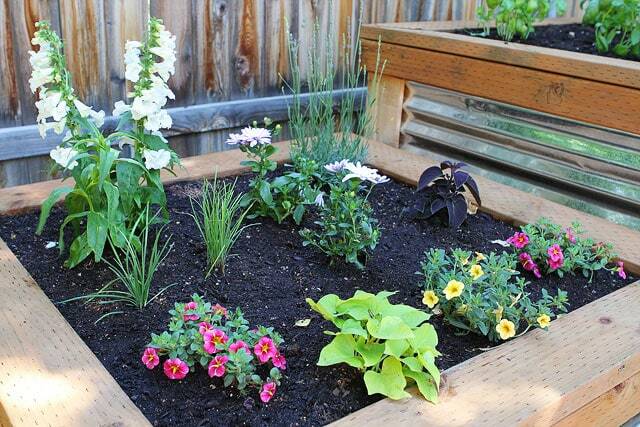 Very attractive garden Beds. I prefer those more elevated. Why not to plant some organic veggies? We have a huge veggie garden already. We did these beds for herbs and flowers. Wow!!! Could you send me your husband for a week? Pleeeease! It’s wonderful in Germany at the moment. Thank you for posting the pictures, it looks great! Your gardens look fantastic. The sheet metal sides look really great combined with the timber and they are not only functional but durable as well. Congratulations it looks great. I just love the project and the results. 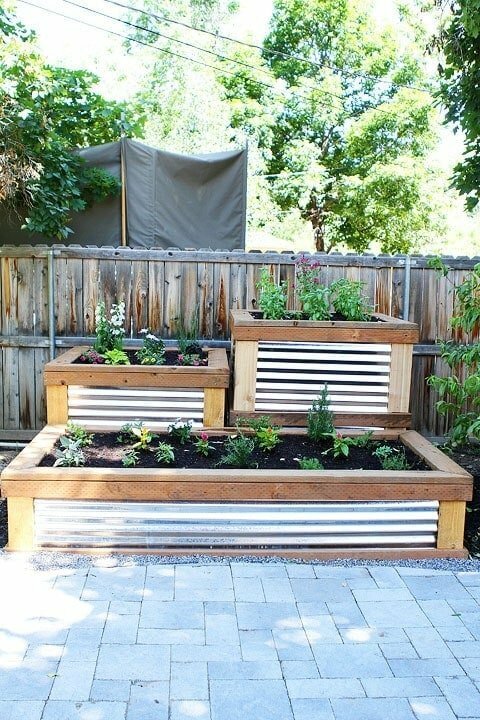 I wish you had shown a step by step tutorial how to build the planters though so others could build them also. I love this! Would love to build something similar in my yard…although my thumb is not very green! This is the most pinned picture on my boards. LOL! I must get at least 20 emails a day saying someone pinned this! Great job! I’ve been looking for plans for this ever since my wife and I saw the commercial for Lowe’s highlighting this project, but we can’t find them anywhere. Do you have a link to the plans? We haven’t seen the commercial! I didn’t know they made one. Thanks for letting us know. My husband designed and built the herb garden. The plans aren’t online, but I will ask him if he can share them! Are you sure that you used aluminum? Lowes only carries galvanized metal roofing, not aluminum. I have called every Lowes in my area and they tell me they have never carried aluminum only galvanized metal sheets of metal. You can use the galvanized metal roofing. I saw these on DIY network, they said I could find the directions to make them on the lowes site. I looked and can’t find them, can you give me the directions and materials list to make these? Hi! I love this! I am going to try and attempt this in my backyard. Would your husband happen to to have the measurements he used or did he just do it as he went? Also, roughly how much did it cost? Thank you! You have great stuff! I really love that raised bed. Especially the metal on the sides. Very classy look! 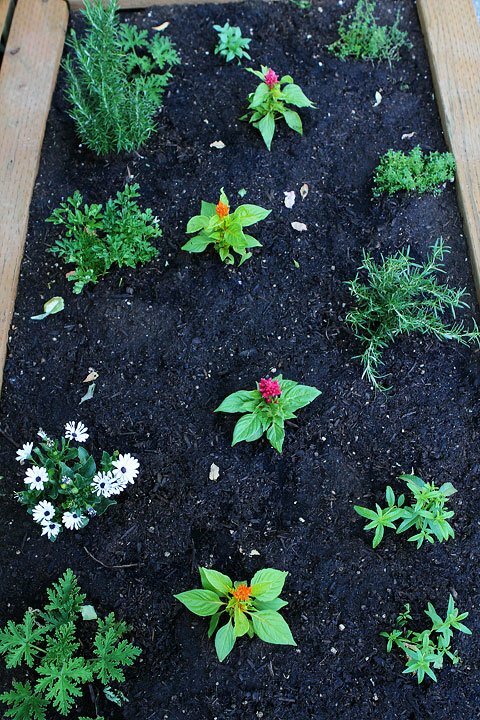 Keep us posted on how your herb garden grows! I am concerned about the pressurized wood and tin used with plants you will eat. 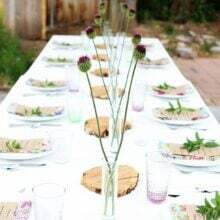 They are fine for flowers, but check out the chemicals in pressurized wood considering how long you will use the garden and the breakdown of materials/chemicals needed to pressurize the wood and the tin. These look great! I love the addition of the metal siding. My husband and I (first time homebuyers) are in the process of installing a concrete paver patio ourselves (goin’ for the cheap!) 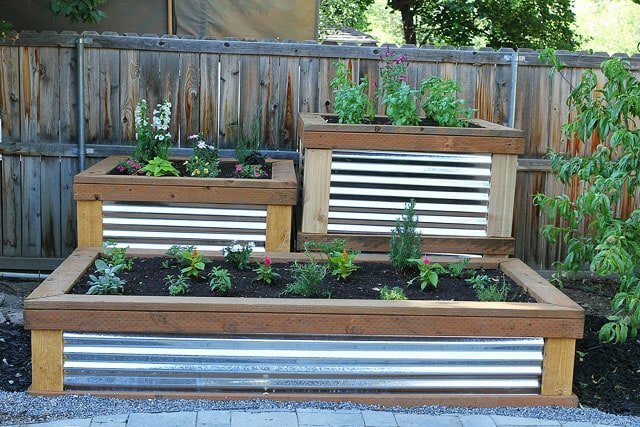 We want to do make some raised beds like these, but a little narrower to go around the patio. How long did this project take? Are they just laid on top of the original ground, or did you dig a few inches below to set them in? Also, a new blogger with a similar theme to yours, I love what you guys do. 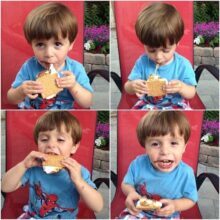 Great photos, delicious recipes and we get a glimpse of who you are through your writing! Look forward to reading more! I love it. Do you have a website to show step by step how you made it. Hety there,really nice job. Where did the 4x4s go? I’m guessing 2×6 on the corners, 2×4 on the top and sides, and the 4x4s somewhere inside? I love this so much! I’ve been thinking of things to do in our sad little back yard for a while. I apologize if someone has already asked this, but is there any way you can post the plans for this? I sent it to my husband and he’d like to build this but the plans would be super helpful! I have a question, is the roofing for decoration only or is it actually holding the soil in place? If it is holding the soil in place do you worry about it bowing out? I have three rose bush/trees that have broken out of their pots they are bulging..LOL Thought about making something like this to build around them. Are there instructions for building these? Thsee boxes are really pristine and beautiful. Brilliant! Any chance you can send along the DIY specs and instructions? I’d like to try it giving you guys the credit of course. Great planters! Do you have more detailed plans? Also wondering about durability- reviewers on Lowes site [using the galvanized for roofing] complained they dented easily and were rather thin. Now that you have 3 years experience, are the sheets heavy enough or would you have preferred heavier material? Did you put a tub of any sort inside the frame or just fill it with dirt? Is there irrigation attached? They look great! Are you concerned about the chemicals in the wood that may leach into your soil? Pressure treated wood equates to toxic wood. We want to do this. Do you have the measurements for each cut ? thank you so much ! Thank you for posting this. My wife wants to do a garden and I’m not willing to do simple flower boxes as I like to sometimes be an over achiever, like lol. I’m thinking about surprising her (or at least attempting to surprise her over the next two weeks. I’m not sure how to build them without her seeing it, but I’m thinking about clearing a space in my garage and sneaking out to do it. I love the idea of the metal (it looks amazing) and I think the three tiered boxes will give her a little different ideas. I will also try to plant all along one of our side walls. It will also play well on the other side of our small/medium back yard across the small walk from my firepit. Where do I get the instructions?